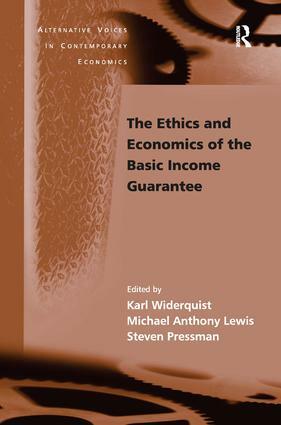 Contents: Foreword, Guy Standing; Acknowledgments; An introduction to the basic income guarantee, Michael Lewis, Steven Pressman and Karl Widerquist. History: In the shadow of Speenhamland: social policy and the old Poor Law, Fred Block and Margaret Somers; Inheritance and equal shares: early American views, John Cunliffe and Guido Erreygers; The guaranteed income movement of the 1960s and 1970s, Robert Harris; A retrospective on the negative income tax experiments: looking back at the most innovate field studies in social policy, Robert A. Levine, Harold Watts, Robinson Hollister, Walter Williams, Alice O'Connor and Karl Widerquist. Debate: Basic income in the United States: redefining citizenship in the Liberal State, Almaz Zelleke; Basic income, liberal neutrality, socialism, and work, Michael W. Howard; Does she exploit or doesn't she? Karl Widerquist; Perhaps there can be too much freedom, Michael Anthony Lewis. Evidence: Income guarantees and the equity-efficiency tradeoff, Steven Pressman; Have the 1996 welfare reforms and expansion of the Earned Income Tax Credit eliminated the need for a basic income guarantee in the United States? James B. Bryan; Back to work incentives in a dynamic perspective: an application to French labour markets, Thierry Laurent and Yannick L'Horty; Social minima in Europe: the risks of cumulating income-sources, Stephen Bouquin. Proposals: The political economy of the basic income grant in South Africa, Nicoli Nattrass and Jeremy Seekings; The approval of the basic income guarantee in Brazil, Eduardo Matarazzo Suplicy; The basic income guarantee in Europe: the Belgian and Dutch back door strategies, Yannick Vanderborght; The cost of eliminating poverty in Canada: basic income with an income test twist, Derek Hum and Wayne Simpson; Can a negative income tax system for the United Kingdom be both equitable and affordable? Randall Bartlett, James Davies and Michael Hoy; Index. The Alternative Voices in Contemporary Economics series provides an important platform for new and innovative approaches to economic analysis within the following traditions: Post-Keynesian, Feminist, Institutional, Marxian, Sraffian, Radical, Austrian, and Behavioural. This series offers researchers working in these heterodox traditions the opportunity to address methodological, theoretical or empirical issues. The series editor works closely with authors and editors to ensure the quality of all published works.